iPage Web Hosting Review & Rating 2019: Cheap But Speedy? Do you need a reliable hosting solution to power your website? Which web host can you trust? Most businesses need a website to show their online presence and promote products. A great website is important for a successful business. The condition is that you need to pick a reliable web host that offers solid hosting solution with high performance and uptime. Only high performance and uptime will satisfy your clients and attract more potential clients. Don’t know which web host you should choose? Our experts purchased and tested all the popular web hosts. We wrote review based on test results to help you pick the provider you need. iPage is a very popular web host. Is it reliable? Does it offer high performance and uptime? Get your answer in this iPage review. iPage was founded by Thomas Gorny in Burlington in 1998. It is a leading web hosting on the market which delivers reliable, affordable and easy-to-use hosting service. This service is backed by a team of experienced and knowledgeable experts. They use advanced technology and put lots of effort on the network to ensure all customers have great experience. Their experts use analytics tool to monitor and track website’s performance. They fix issue and eliminate threat timely before they can harm your website. They are always available no matter you need help in designing your site, setting up your email account or publishing the site. As an advanced web host, it allows unlimited disk space, unlimited MySQL databases and scalable bandwidth. You are allowed to host unlimited domains within your iPage hosting account and create unlimited email addresses at your own domain. This provider promises 99.99% uptime guarantee to let your clients access your website easily. It offers free SSL certificate and other solid security suites to safeguard your website. When you purchase an iPage hosting plan, you will get a free domain name for one year. Many popular apps are available with iPage. With them, you can create an online store, start a blog or set up a photo gallery as you need. It offers easy installation of apps such as b2evolution and WordPress. The drag-and-drop website editor is very helpful. iPage offers 30-day money back guarantee. If you find out the server is not what you want, you can contact them within 30 days of purchasing and request a refund. They will give you a refund with no questions asked. iPage also is a newbie-friendly service. If you about to start a project or business, you can start with a shared hosting because it is a cost-effective solution. As you share server space and resource with other customers, you only need to pay a small amount of fee. If you need more server space, simply upgrade the plan. iPage offers one Linux-based shared hosting plan. It starts at $1.99 USD per month. If you purchase a shared plan, the server usage will be split between several customers. You don’t have to take care of the server maintenance. It won’t require complicated technical knowledge. There are thousands of professional looking templates for you to design your website. As shared hosting plan comes with limited storage, your website typically can’t handle high traffic. It accommodates beginning websites and projects. If you expect high traffic volumes without paying expensive fee, VPS hosting is a good option. 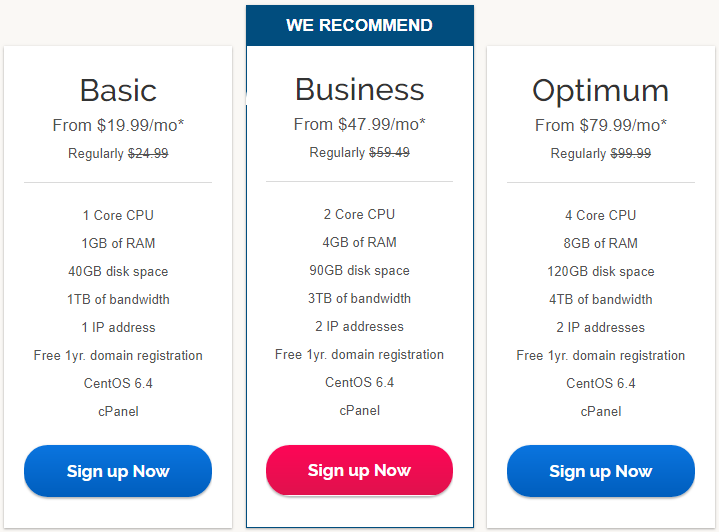 A VPS is more expensive than a shared hosting, but cheaper than dedicated server. iPage offers affordable VPS hosting. It starts from $19.99 USD per month. There are Basic, Business and Optimum plans. As VPS hosting package comes with more storage space and resource, your website’s performance won’t be affected by other websites on the server. It offers best possible server speed and reliability with high-speed SAN storage and guaranteed memory allocation. Your website will be able to handle much higher volumes of traffic. Besides, iPage VPS allows you to customize and configure the hosting environment to meet your needs. You also can install related software or extra applications to optimize the website. That will require related technical knowledge make the use of the VPS plan thoroughly. Of course, new users still can work with it greatly. You can find useful videos guides or contact their customer support for instant help. Dedicated server is the most expensive option while iPage offers affordable packages. The dedicated plan suits websites with high traffic. As the only owner of a server, you have root access to the resource and own all the computing resources. There is no limit to install a piece of software or do other basic configurations. You have complete control over almost all aspects of your hosting plan. To take care of the operating system, applications, coding and scripts, you will need to learn related technical knowledge or hire a skilled IT guy to do the job for you. Unlike other web host, iPage does not use the cPanel Control Panel. Instead, it uses vDeck control panel. From there, you can manage features and execute tasks conveniently. If your website has a large number of visitors and has feature-rich pages, dedicated server is needed. You will get enough resources and high performance to power your website. Your clients will be satisfied with the fast load time even at peak hours. Your website will be able to handle various types of traffics smoothly. iPage has Startup, Professional and Enterprise dedicate hosting plans. It starts from $119.99 USD per month. Give it a try and you will know how amazing it is. iPage offers two WordPress hosting plans including WP Starter and WP Essential. Both plans offer a free domain name for one year and unlimited storage, email & monthly data transfers. 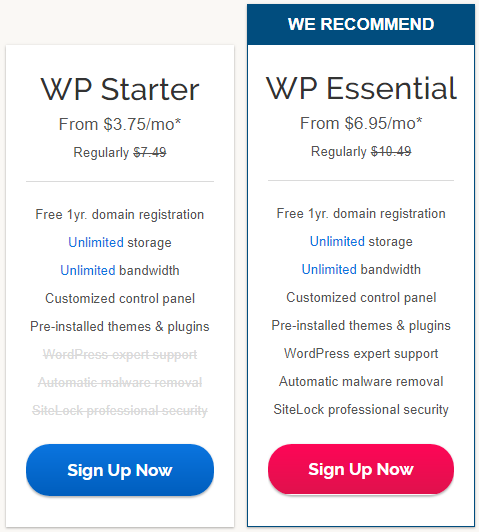 WP Essential plan includes more solid security and WordPress customer service. This web host offers hand-selected themes and pre-installed plugins to let you start your project easily. Select the theme you like and apply plugin you need. There is no complicated process to go through. It offers a fully customized WordPress control panel to let you manage all aspects of your account. Another attractive point of iPage WordPress is that it is good at creating a search engine friendly WordPress platform. It offers good suggestions and solutions to design your website in a professional way to gain high ranking on all major search engines. That will make potential customers to find you easily and promote your website or business effectively. Besides, iPage has mobile optimized site builder. As most visitors use mobile devices to browse, it assists you to design a website adaptive to mobile devices in order to attract more customers. Start your project with iPage now. It only costs $3.75 USD per month. iPage delivers a deluxe security bundle. No matter which hosting plan you sign up, you will get a SiteLock security suite for free. What is SiteLock for? SiteLock is a useful tool that scans for malware issues regularly for you to prevent unwanted security breaches. You will get different levels of protection based on which hosting plan you choose. Every customer has basic protection. Malicious programs will be stopped away from your website, app or store. Some plans include extra features like eliminating harmful threats for you. If you are experienced IT guys, you can handle this issue easily. Besides, iPage offers a firewall to safeguard your website and prevent any potential security leaks. It informs you when new versions of plugins are available. You can set it to update automatically to ensure your website is always protected by the latest technology. That will leave no hole for others to attack your websites. If you build a website to run your business, SSL certificates is a necessary. You don’t have to particularly choose it because any iPage hosting plan includes a free SSL certificates. It will encrypt your communication data to prevent any attack and information leak. When your customers purchase your product or make a transaction on the website, all the payment processed is encrypted with high standard as leading banks offer. The payment information is protected. Only you offer secure payment and transaction environment can you achieve customers’ trust and run your business successfully. For extra protection, you also can purchase premium SSL certificates. iPage promises 99.99% high uptime. Website uptime is a very important factor when selecting a hosting service. If the web host offers low uptime, your website can be down frequently. Once your website is down, visitors won’t be able to access your products or find your website. Rare users can trust such an unstable website or platform. That will be bad for your business’s reputation. Poor uptime also makes it difficult for your website to rank high on search engines. When we tested this hosting service, we monitored and recorded all related data. In the end, we figured out that iPage offers awesome uptime. We didn’t suffer serious issues or have unpleasant drop during the testing period. Want 99.99% uptime? 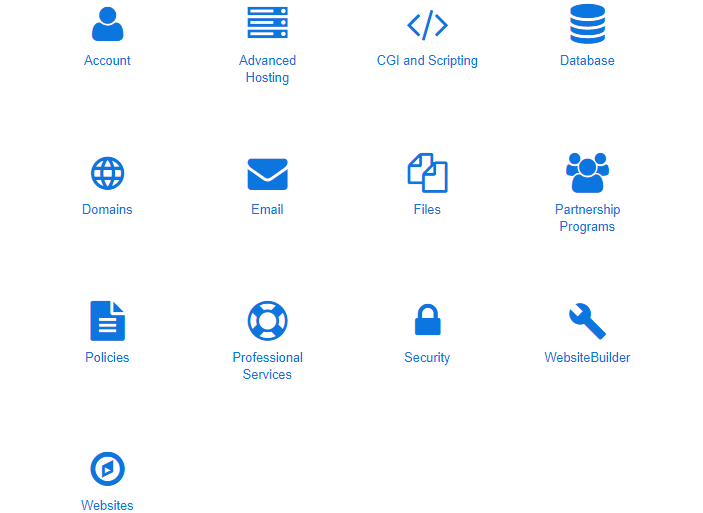 Get started with iPage hosting service. It offers a collection of useful designing and building tools to make developers’ life easier. Customers will be able to set up your account immediately after the signup. The process to get started with iPage is designed to be simple for all customers. Simply follow the clear setup wizard. The iPage Website Builder includes lots of plugins and features to enable both beginners and experienced developers create and develop a professional-look website within minutes. iPage provides hundreds of templates and themes. You can choose any one of them to design your website in the way you like freely without paying extra fee. It offers convenient and reliable content manage systems, allowing you to develop your website efficiently with the help of WordPress, Joomla! and Drupal etc. This service also supports photo galleries like Gallery2 and ZenPhoto etc. and forums like Gbook, phpBB and SMF etc. to assist customers to develop project easily. WordPress 1-click installer is available, so you can create a popular platform for your websites instantly without learning special knowledge. To ensure your website & project work normally all the time, iPage provides decent support through phone, email and live chat. You will find its toll-free number on the official website. Phone call is the fastest way to talk to the support team and fix your issue. If you are not in a rush, you can fill the support form and submit a ticket. You will receive a clear solution that is well-organized in an email while it will take longer time to get a respond. If you refuse to talk to the support agent while want instant support, click on the live chat button on their official website. You don’t need to wait for long. The support agent will pick you up quickly. Simply tell them your issue. They will answer your question and provide instant solution. During the period we tested the service, we got pretty fast respond and satisfied solution when we contacted them via live chat. Problem was fixed immediately. We also tried to call them. The support agent was patient and knowledgeable. She answered our question in a professional and provided clear guides. We found their customer support was very useful and effective. How to Get Started with iPage? So, how to start your project with iPage? Does that require complicated computer knowledge? No. In fact, it’s a simple process. There is no need for you to learn how to write code to set up a professional yet simple to use website. Here is the basic process to get started with iPage. Firstly, pick a unique and special domain name for your website to make it impressive for visitors to remember. If you already have one, simply transfer the data to this server when you are ready. Secondly, use coupon link on this page for sweet discount. Thirdly, sign up a hosting plan you need and activate your account in your email. Fourthly, create and design your website with the templates, themes, plugins and tools offered by the provider. You only need to select the theme you like and templates you need. With few clicks, you can implement and personalize your website easily. Next, simply follow the wizard to finish the rest job. Website hosting is a learn-as-you-go venture, and you will learn more and become professional after using hosting service for a period of time. If you are in a jam or need extra assistance, contact the tech support team any time. iPage is a reputable hosting provider that offer solid hosting packages at affordable price. It allows unlimited MySQL databases, disk space, domains, emails, as well as bandwidth to offer high-performance and load-balanced servers. Dual OC-48 connections on diverse backbones are available. It supports third-party applications and offers solid tools to help developer design and improve their project successfully. It provides FileManager which is a tool to let you upload and download files via FTP without a client. Mojo Marketplace is available. It is a one-click installer that comes with lots of themes, plugins, graphics & logos, and all kinds of add-ons to make your job easier. This web host offers top-notch security options to safeguard your website. It has 24/7 security with network monitoring to ensure high uptime. It also provides NetApp snapshot backups for your data and POP/IMAP support for email. You can manage your account easily with the sleek and intuitive control panel. It is easy to view visitor statistics and site traffic reporting as well. If you need help in creating or designing your website, contact the friendly customer support. They are always available for you. iPage offers honest, upfront, and cheap pricing. There is no hidden fee. It provides scalable service. You can downgrade, upgrade or cancel the plan any time to suite the development of your website. iPage offers money-back guarantee. You can try this hosting service without a risk.